Gyeon Foam is a high foaming car wash shampoo that will help you clean your vehicle thoroughly! Dirt, grime, tar and other heavy contamination buildup is inevitable unless you park your car in a garage and never take it out for a spin. This contamination can be a pain to remove, but with a good pre-washing you can break this contamination down, allowing for easy and safe removal. 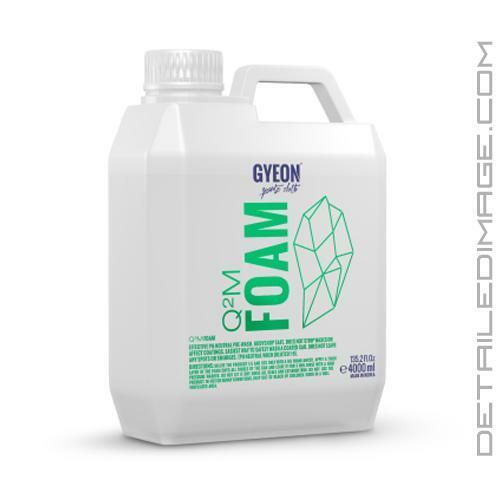 Gyeon Foam is a high end shampoo that has been designed for use with a Foam Lance or Foam Cannon. During application, you will find that this shampoo builds up a very thick foam, that sticks to every surface on the exterior of your vehicle. The key word is "sticks" and this shampoo does just that. It is so thick that it sticks to the surface, covering dirty areas of the paint and dissolving any dirt and grime it comes into contact with. This allows you to rinse off the foam before it dries, removing a great deal of contamination in the process. When you go over your paint with more shampoo and a wash mitt, less contamination will be on the surface, greatly reducing the risk of adding imperfections to the paint. Gyeon Foam has a minimum dilution of 1:15, especially on already coated vehicles, but Gyeon recommends using a dilution of 1:5 for extremely dirty vehicles. If you want to apply a thick layer of foam to your paint, grab yourself a bottle of Gyeon Foam today! Does not strip waxes or affect coatings. Easiest way to safely wash a coated car. Does not leave any spots or smudges. Dilute the product 1:5 and use only with a HQ foam-lancer. Apply a thick layer of the foam onto all panels of the car and leave it for 5 min. Rinse with a high pressure washer. Do not let it dry. Rinse all seals and exterior trim. Do not use the product in hot or sunny conditions. This product works very well as a pre rinse before actually hand washing a vehicle. Produces a lot of foam with very little product making it cost effiecient. I would recommend this product of your looking for an effective pre rinse solution. I love this foaming agent mixed with Chemical guys clean slate into a foam cannon when deacon a vehicles paint and prepping it for correction. The foam makes the solution stick to the vehicles finishing allowing the clean slate to remove as much contaminates and waxes/polishes as possible. Excellent pre-wash to prevent swirling when my vehicle are really dirty and grimey I always use a pre-wash to get majority of the filth off then go back and do a hand wash bit overall its a great product.